BILOCCA. On February 12, at Christus Sacerdos Home, Birkirkara, Fr PELAGIUS BILOCCA, OFM, Cap., aged 86, passed away peacefully comforted by the rites of Holy Church. He leaves to mourn his loss the Capuchin Province of Malta, his brother Joseph, his brother Br Thomas of La Salle, his sister Mary Zerafa, his sister Katie Attard and her husband Paul, his brother Tony and his wife Mary, nephews and nieces and other relatives and friends. Mass præsente cadavere will be said tomorrow, Thursday, February 14, at 9.30am, at Holy Trinity parish church, Marsa, followed by interment at Santa Maria Addolorata Cemetery. Lord, grant him eternal rest. FALZON. On February 13, at Karin Grech Rehabilitation Hospital, MARIANNA of Rabat, aged 90, comforted by the rites of Holy Church. She leaves to mourn her loss her sister Pawla, widow of Emanuel Azzopardi, her brother Joseph, her nephews and nieces Ray, Luke, Maria and Pauline, their spouses, other relatives and friends. The funeral leaves Mater Dei Hospital on Friday, February 15, at 2.45pm, for St Paul’s parish church, Rabat, where Mass præsente cadavere will be said at 3.30pm, followed by interment in the family grave at Santa Margherita Cemetery, Rabat. No flowers by request but donations to Id-Dar tal-Providenza, Siġġiewi, will be appreciated. Lord, grant her eternal rest. FARRUGIA. On February 11, at Mater Dei Hospital, CHARLIE, former director, Ci-Square Co. Ltd, aged 71, went to meet the Risen Lord comforted by the rites of Holy Church. He leaves to mourn his loss his wife Doris, his children Noel and his wife Rita, Silvio and his partner, Maria and her husband Raymond, his grandchildren Isabelle and her husband Michael, Charlene and her husband Owen, Jasmine, Matthias, Christine, Stephanie, Luke, Jeanie, Kalean and all their fiancés, his brothers and sisters, in-laws, other relatives and friends. 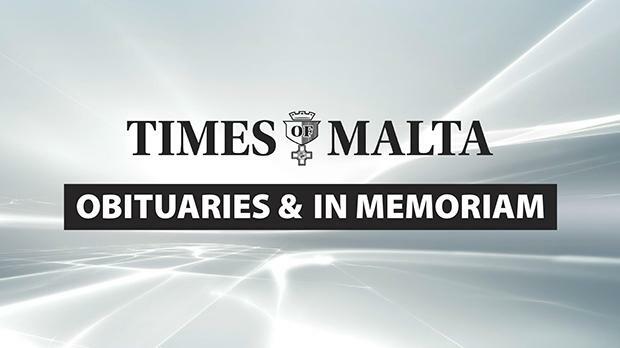 The funeral leaves Mater Dei Hospital today, Wednesday, February 13, at 1.30pm, for St Sebastian parish church, Qormi, where Mass præsente cadavere will be said at 2pm, followed by interment in the family grave at Qormi cemetery. No flowers by request but donations to Puttinu Cares, Mater Dei Hospital, would be appreciated. Lord, grant him eternal rest. MIFSUD. On February 11, at Mater Dei Hospital, EDWIN, passed away peacefully at the age of 83, comforted by the rites of Holy Church. He leaves to mourn his great loss his beloved wife Eileen, née Felici, his daughter Rachelle and her husband Malcolm Spiteri, his son Edward and his wife Barbara, his grandchildren Emma, Tim and Sam, his sister Rosette and her husband Neville Abela, Joe Farrugia, widower of his sister Lynette, Marie Louise, widow of his brother Richard, and Doris, widow of his brother Josie, his in-laws Phyllis and Mario Aquilina and Myriam Diacono, nephews and nieces, other relatives and friends. The funeral cortège leaves Mater Dei Hospital today, Wednesday, February 13, at 9am, for Stella Maris parish church, Sliema, where Mass præsente cadavere will be said at 9.30am, followed by interment at Żebbuġ cemetery. No flowers by request but donations to id-Dar tal-Providenza, Siġġiewi, will be greatly appreciated. Lord, grant him eternal rest. The family would like to thank all the staff at Ward MAU2, Mater Dei Hospital. ARRIGO AZZOPARDI – CHARLES. Treasured memories of my dear brother, today the 13th anniversary of his death. Always remembered in thoughts and prayers by his sister Doris and Vince Muscat and their respective families. A prayer is kindly solicited. BONELLO. In loving memory of our dear parents DIONE and MARY who went to meet the Risen Lord on February 13, 2002, and May 14, 2015, respectively. Still missed and loved by their son Charles and daughters Kay and Mardion. Rest in peace. FORMOSA – MARIO (ex-BoV). Loving memories of a beloved husband and father, today the sixth anniversary of his demise. Deeply missed by his wife Antoinette, his sons David and his wife Katrina, Michael and his girlfriend Luana. Always in our thoughts and prayers, forever in our heart. Lord, grant him eternal rest. GAMBIN. Loving and happy memories of JOHN, a beloved husband, father and grandfather, today being the eighth anniversary of his demise. Sadly missed but never forgotten by his beloved wife Rose, his beloved children Charles and Marcelle, Josette and Alfred Sciberras, his grandchildren Sarah and Jonathan. Forever in our hearts and prayers. Lord, grant him eternal rest. MERCIECA. In loving memory of DORIS who passed away seven years ago today. Always in our thoughts. Please remember her in your prayers. Johanna and Caroline and their families. PEPLOW. Cherished memories of a beloved wife, mother and nanna, JOYCE, née Joyce, especially today being her 77th birthday. To us you were the world. Always in our hearts and prayers. Edgar, William, Alice and family. Lord, grant her eternal rest. TABONE. In loving memory of a dearest mother and grandmother, MARGARET, today being the seventh anniversary of her passing to eternal life. She is fondly remembered by her children Kay and Philip, Paul and Liz, George, Stephen and Angela, Bobby and John. She is also lovingly remembered by her grandchildren and great-grandchildren. Lord, grant her eternal rest. VELLA. Cherished and unfading memories of our beloved brother, Mgr JOSEPH VELLA, who passed away to eternal life on February 13, 2004. Forever in our hearts and prayers. Vivienne, Antoinette and Marthese and their families. Lord, grant him eternal rest.